Audio Tags. Now Vorbis Comments in FLAC and OGG files are supported. They can be shown in columns, in reports, and on mouse hover. And you can use them in file search and scripts. 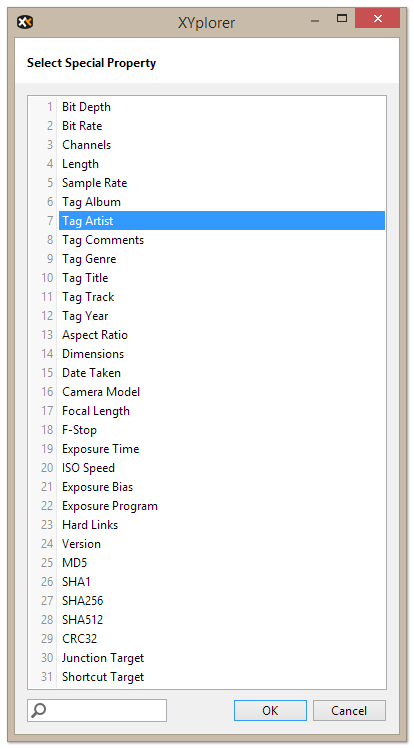 Audio tags in columns, and in a file info tip on mouse hover. 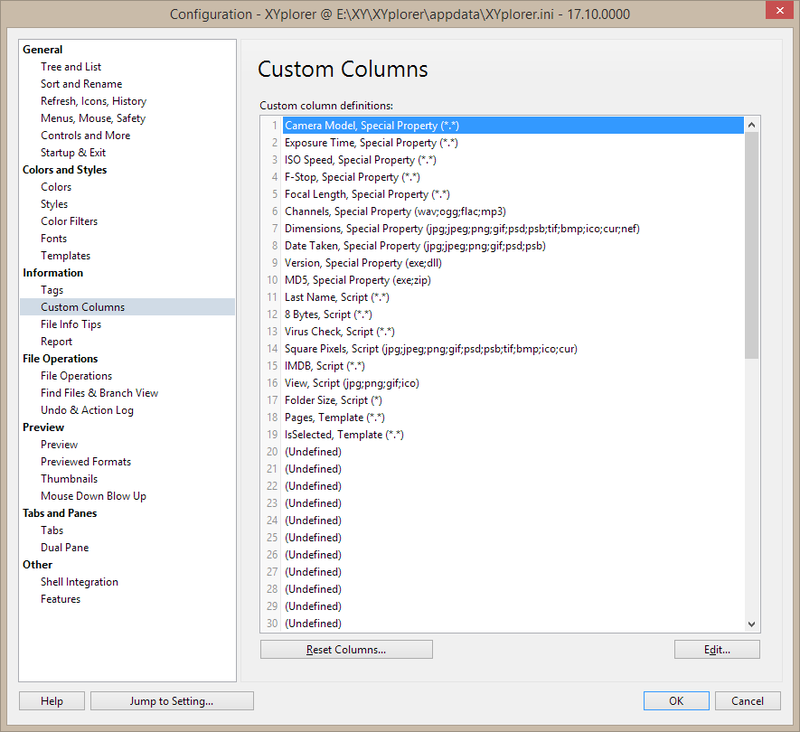 Selecting one of the seven Tag properties for a column. 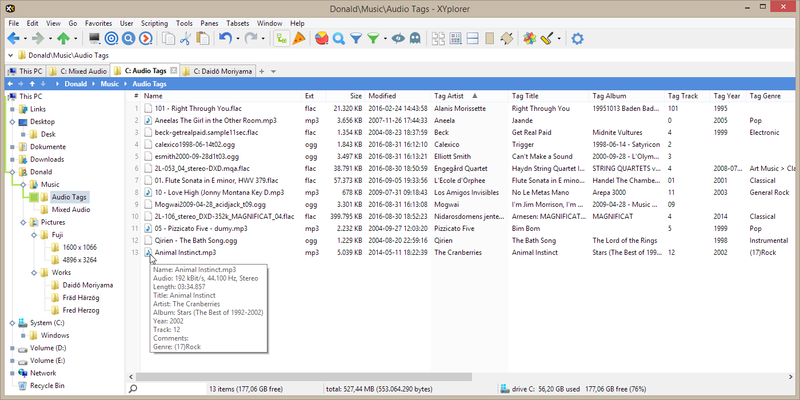 Save it to a file called "AudioTags.txt" located in "<xydata>\Columns" (pass this path into the XYplorer Address Bar to go there). 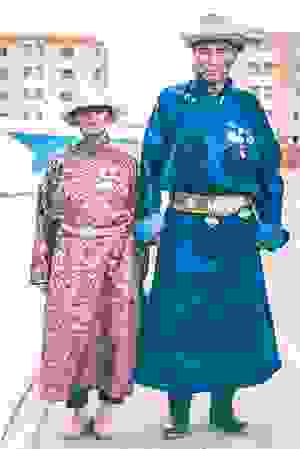 Then load this column layout file via View | Columns | Load Column Layout.... To spare the saving part you can [download AudioTags.txt] and move it to "<xydata>\Columns". 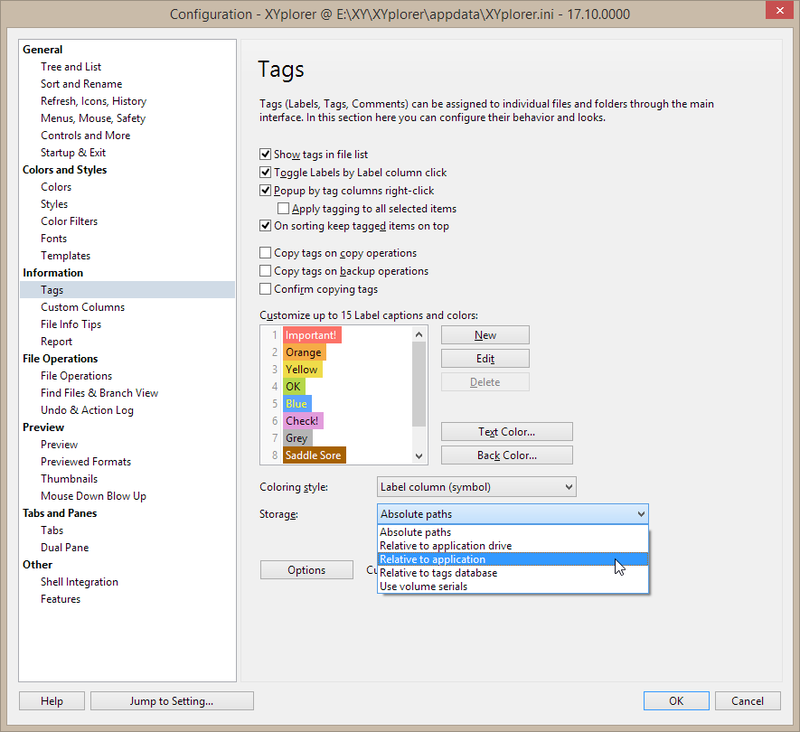 Simply tick Configuration | File Info Tips | Show audio info and tags. On mouse hovering a file a tooltip will pop up showing basic audio info and tags. 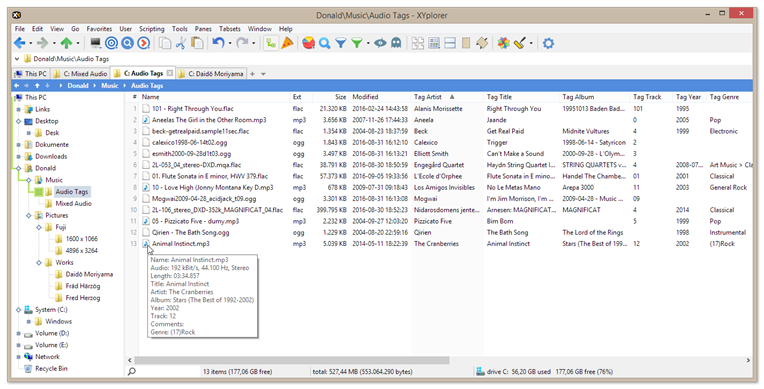 Supports ID3v1 and ID3v2 tags in MP3 files, and Vorbis Comments in FLAC and OGG files. A nice feature for audiophiles. Audio info and tags popping up. Safety Belts. Added an optional native delete confirmation prompt including deep stats. Tick Configuration | Menus, Mouse, Safety | Safety Belts | Confirm delete operations to get a confirmation prompt before any delete operation, be it to recycler or permanent. The prompt is native to XYplorer and it is shown before the Windows delete confirmation prompt (if there is one and it’s not suppressed, see here). The prompt includes deep stats which means any folders among the selected items are recursed and the contained items are counted and their sizes measured. So you will exactly know how many files and bytes you are about to delete. 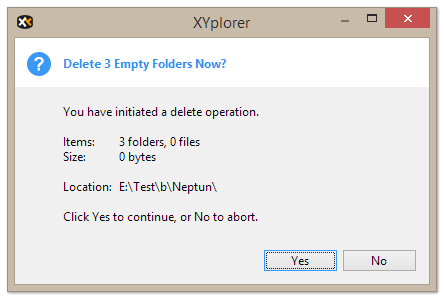 XYplorer delete confirmation prompt for empty folder. The XYplorer native confirmation prompt becomes particularly useful when you travel with portable XYplorer and board an unknown host system where the Windows Delete Confirmation might be turned off. Then you can quickly turn on XYplorer’s prompt and be back on the safe side without modifying the host system. 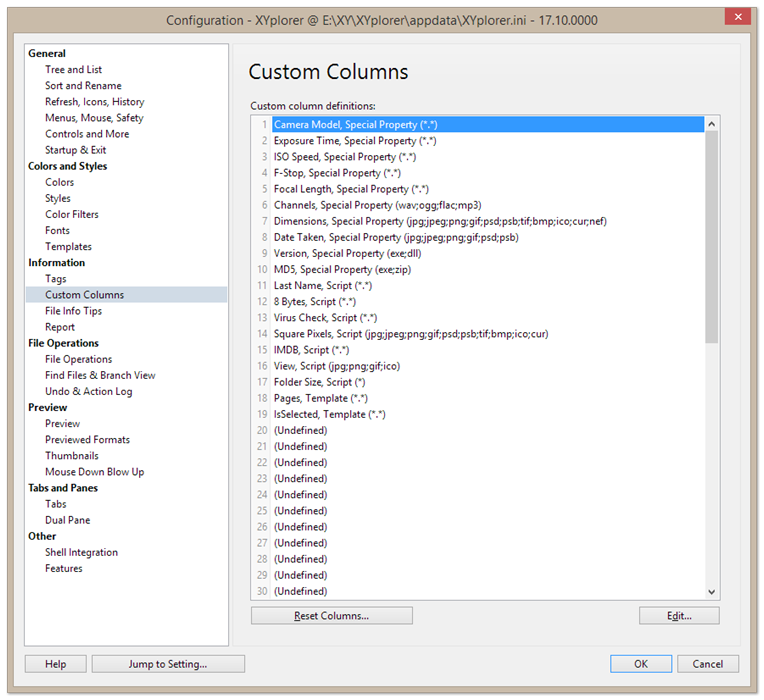 Custom Columns are user-defined columns that can be shown in the file list. Now you can have 64 of them in your arsenal. The savethumb() scripting command (see also here) now allows you to control the JPG quality of the created thumbnails. For more details please see the Help file. A new Storage (in Configuration | Tags) option makes it much easier for you to travel with your tags. E.g. 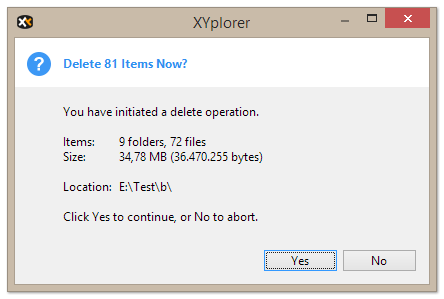 choose "Relative to application" if XYplorer and the tagged items are on the same portable drive (USB stick, etc.). Even more options are offered by the new scripting commands tagload() and tagexport(). For details please see the Help file. XYplorer © 2019 Cologne Code Company. All rights reserved.